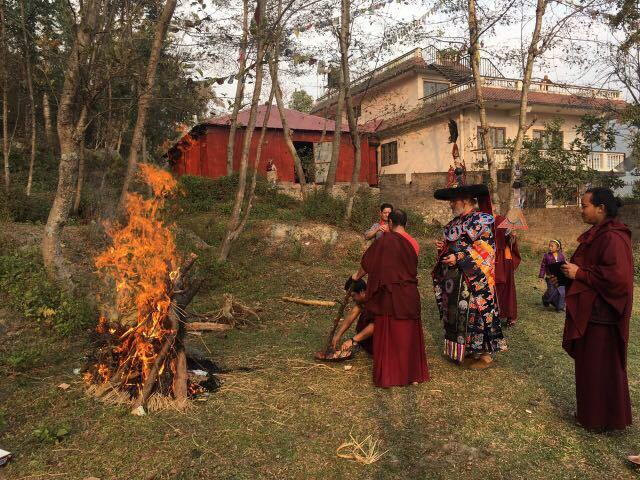 We are now setting our intentions for a special Dakini Retreat to be held around April, 2019 during the time of the famous Sankhu Dakini Festival. The festival, called Sankhu Jatra, orients around the Urgra Tara Goddess descent down from the temple into the town of Sankhu, carried by a large number of the towns people, on a huge heavy wooden chariot. The Mother visits her children throughout the town for around one week and then ascends back up the hill with an enactment of a dramatic physical and emotional tug of war (not letting go of the mother) that transpires between the Newar Buddhists of Sankhu town and the Tamang Buddhists of the mountainside who reside near the temple. Every year, during her procession to the town, The Goddess stops at our center where Bodhivastu treats those carrying her to some snacks and rice chang so that they have strength for the long trip. Lama Rangbar has designed a retreat called the Three secrets of the Dakini, during which we will be practicing the outer, inner and secret aspects of the Dakini according to the Dudjom Tersar tradition. We will begin the outer retreat just before the Goddess begins her descent so that we can welcome her to the center and receive her blessings. During this initial time we will also be overseeing the construction of the retreat Cabins and amphitheater which we will be making at our center. The retreat will then go into a boundaried retreat and conclude just as she returns back up to the Vajrayogini temple. 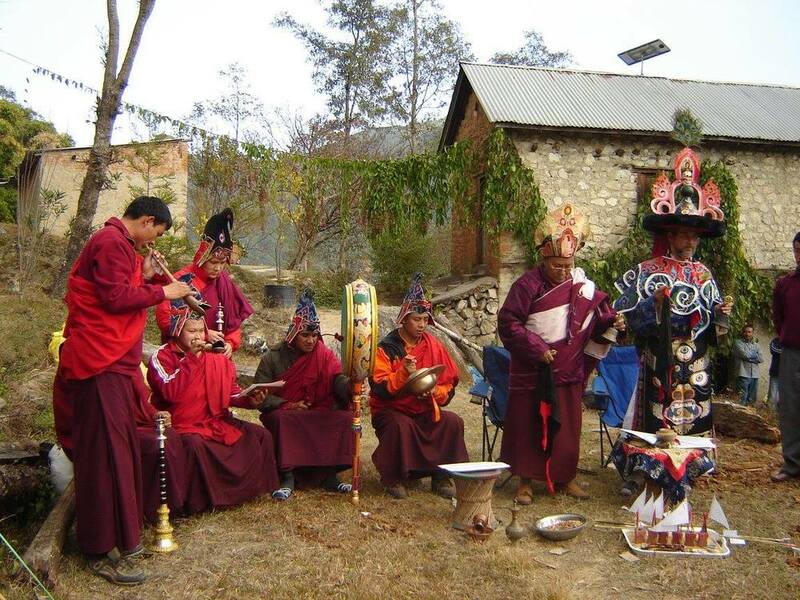 Newar Dances of Vajrayogini, Singhamukhi and Bagalamukhi will be performed by Lama Rangbar's friend Raju and his Newar dance troupe in the first draft of an outdoor Amphitheater. Please put April in your minds and a more precise set of dates will be made public soon. Dechen Mingyur Ling was established in Nepal by Lama Rangbar Nyimai Özer in 1997 as a center for meditation practice, retreat, and sacred arts. The growing campus is located on the eastern edge of the Kathmandu valley above the old town of Sankhu below the ancient sacred temple of the Dakini (Goddess) Vajrayogini. "Here in this place, on the ground there is an eight-petalled lotus flower, in the sky there is the Golden Eight-Spoked Wheel of Dharma, in front is the Auspicious "Southerly niche" and on the left side are the Eight Auspicious Signs (Tashi Tagye). The lord of refuge then offered the name (with his hand-written script below) and said: "Please bring this center to fruition as soon as possible)"
"Ma Dag Kham Sum Khorwa Dong Druk Dechen Mingyurling"
"The place where the three impure realms of cyclic existence are emptied into unchanging great bliss"
"Whenever I go back to our Sankhu Vajrayogini retreat center I am always amazed at the depth and power of the blessings it contains naturally. To begin with, the Blessings of the Lord of Refuge Chatral Sangye Dorje Rinpoche pervade there. Secondly, the blessings of the Great Mother Vajrayogini, are so completely tangible in this place. The experience of peace remains unsurpassable in this holiest of Dakini places. 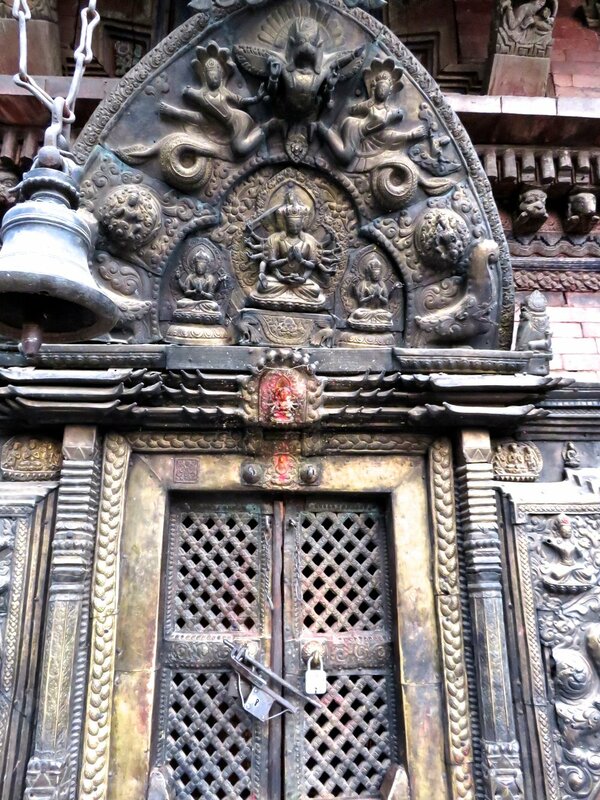 Thirdly, Sankhu Vajrayogini is the gathering place of Guru Rinpoche's Eighty Maha Siddhas and is blessed with several meditation caves carved into the rock such as Milarepa's cave, as well as Tilopa's and Naropa's among others. 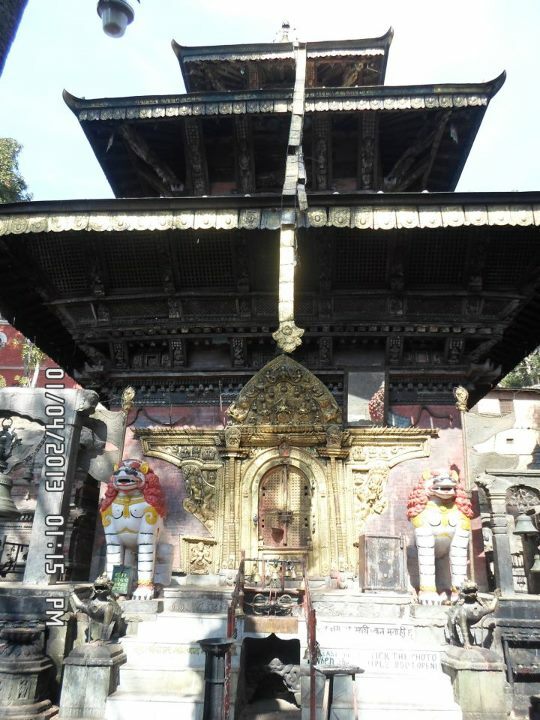 Fourthly, Sankhu Vajrayogini is the place where Guru Padmasambhava found his consort Sakya Demma, who was discarded by the Sakya clan and left to die in the jungle where instead she was adopted and raised by Monkeys. Finally, our center's relation with the community is growing each day and the deeper we go, the more there is to appreciate about the major ethnic Buddhist groups that reside there, the Tamangs and the Newars. The more one explores, the more one finds great depths in the way in which they all embrace the mother both formally by tradition and also informally. In fact, these are only an immensely small fraction of the history and benefits of the location." We have now completed the building of an accomplishment space which will allow for group events such as the Mendrup Drupchen and group retreats. Loppon Namgyal from Dudjom Gompa visited Sankhu with Lama Rangbar this November during the Stupa consecration ceremonies and blessed the ground with an offering to the eight classes of beings. The space was completed by February 2016 and a one month Vajrakilaya retreat was completed. Acharya Dawa Chodrak RInpoche has complete his 2016 retreat and is expressing excellent health as a result. Lama Pema Thobchen and his uncle, Lama Lotoe Tsultrim Gyamtso have recently completed a Troma Ginsek at Dechen Mingyurling as well as the daily practices of the four feasts at our center. Lama Gyamtso enjoyed the center very much as the presence of a small cemetary right next door makes it ideal for Troma practice. Lama Gyamtso is a Dudjom Tersar Lama and a 25 year retreat student of the second Dyegyal Rinpoche. 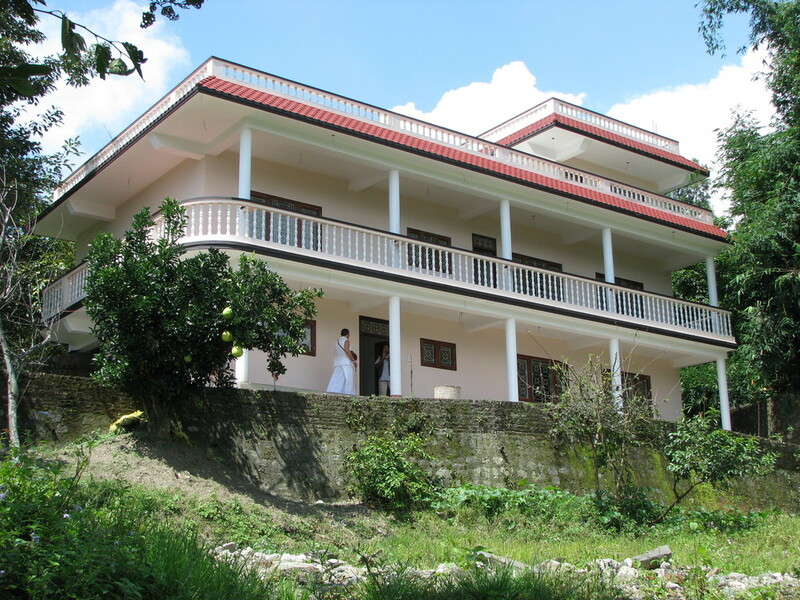 “Our Bodhivastu center in Nepal, Dechen Mingyurling, is situated in one of the five most important holy places of the dakini Vajrayogini in the Kathmandu valley area. Sankhu Vajrayogini has two aspects, the upper temple (currently destroyed by the earthquake, houses Ugra Tara, also known by the local Newars as "Ajima" or "Grandmother", and the lower temple which houses Akash Yogini, Singhamuka (The Lion-Faced Dakini) and Baghamukha (The Tiger-Faced Dakini). 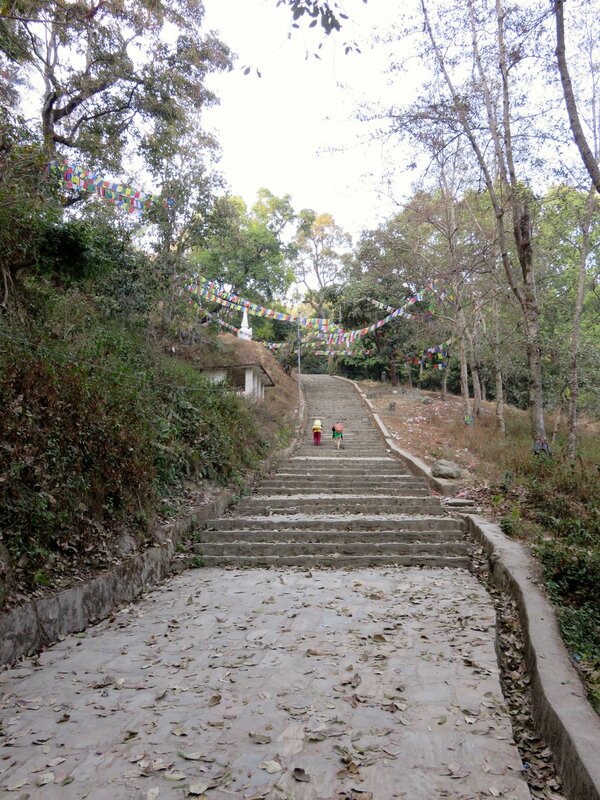 Each year, Ajima comes out of her temple to make the descent down the mountain to the town of Sankhu on a huge heavy chariot carried by the hands of the village deotees in order to bless all the residents of the town. 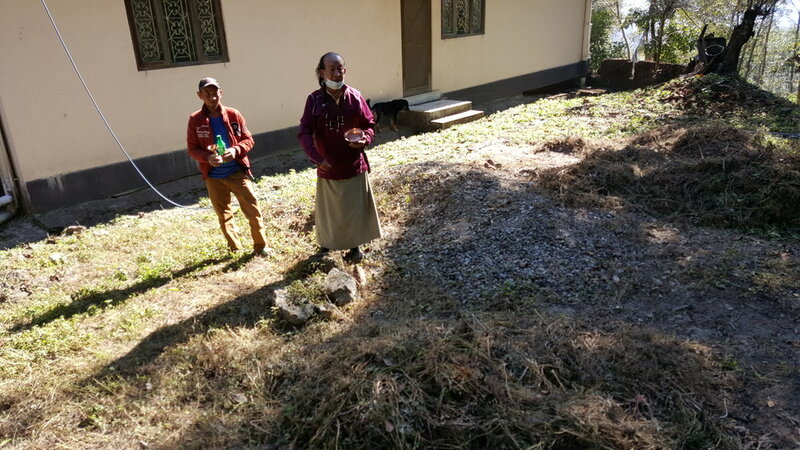 Due to an aspiration prayer I once made during such an event, it has become the town’s tradition for the Ajima to stop at the gate of the Bodhivastu center for a while to bless our center. 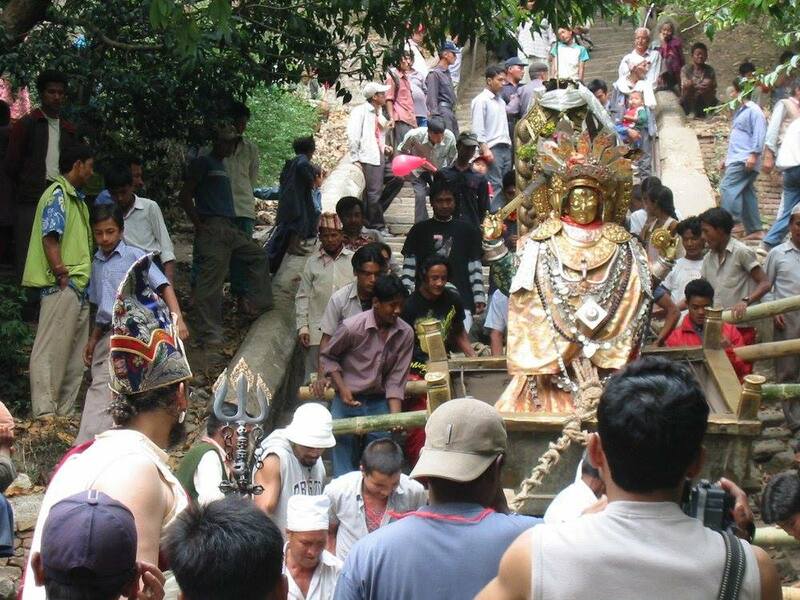 At that time, the villagers carrying the deity, stop for some refreshment and a snack offered by Bodhivastu Foundation. Due to the center’s close affiliation with the Dakini, the Dechen Mingyurling center is an ideal place for Troma Nagmo practice, the super secret form of Vajrayogini. 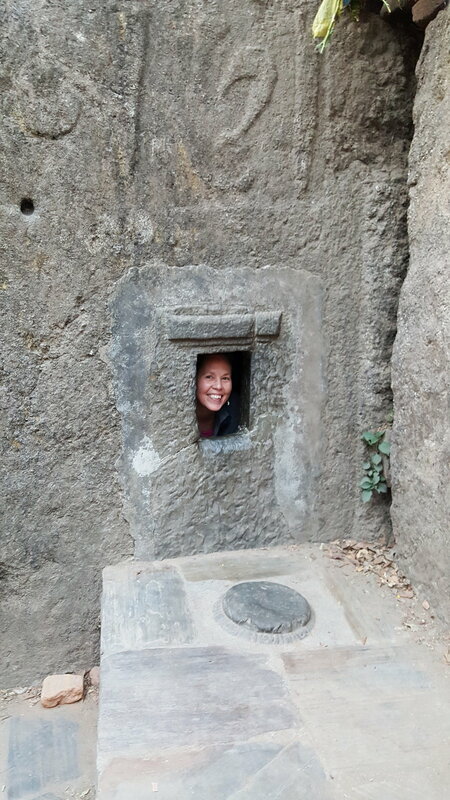 To the eastern boarder of the property is a small cemetery where practitioners can perform Chod, or severance of the ego by way of Lu Jin, generosity of the body." During his recent visit to Nepal Lama Rangbar met with Lama Pema Thobchen a Dharma brother of Lama’s. Lama Pema had been busy assembling the Tibetan Musical Instruments for Bodhivastu in the USA and also visited the Dechen Mingyur Ling center. 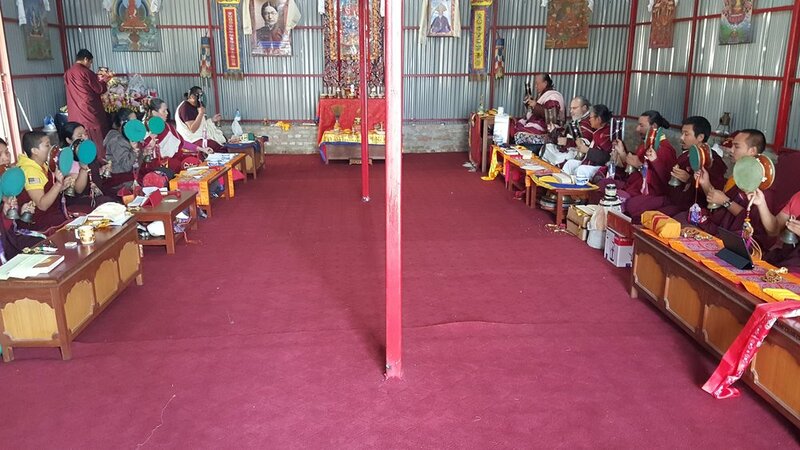 At the center, Riwo Sang Chod was performed with Lama Rangbar and Lama Rangbar and Lama Pema together formed the aspiration to complete a Vajrakilaya Mendrup Drupchen on the 10th month of 2017. This drupchen will be open to a limited group of 30 practitioners, a mix of both Lamas residing in Nepal and westerners who will join to learn this most important process of the making of the great accomplishment medicine from A to Z. The Drup Chen will likely be led by Master of Ceremony, (Loppon) Lama Yedrol, who is well known as one of the most learned and experienced masters for the making of mendrup. The Drupchen is being sponsored in large part by Lynda Eisenberg through the Chintamani Foundation. Additional places to stay will be arranged on the land on tent platforms. Total Shrine room seating is limited to 30 people including the locally attending Lamas. 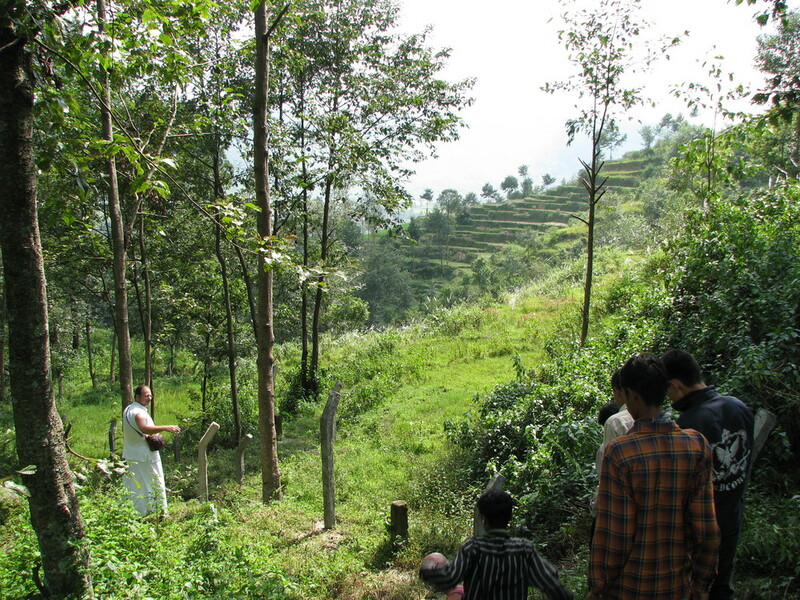 A decision was made to put the center activities into motion on a regular basis and discussions have begun with those wishing to make one retreat house on the land there. 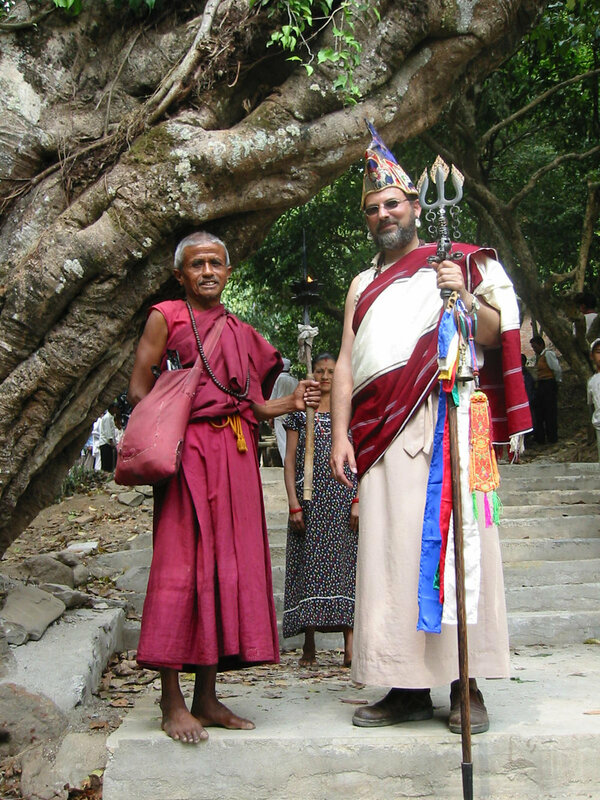 Lama Rangbar with Lama Yedrol Rinpoche discussing the Mendrup drupchen in Nepal.